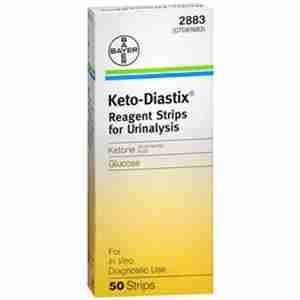 Keto-Diastix Reagent Strips for Urinalysis provides a fast, convenient way of testing urine for the presence of glucose and or ketones. KetoDiastix is a firm plastic strip with a test area made of special chemicals. When dipped in urine, this test area changes colour according to the amount of glucose in the urine. Collect fresh urine specimen in a clean, dry container. Remove one strip from bottle and replace cap. Dip test area of strip in urine and remove immediately. (alternatively, wet the test area by passing strip through urine stream.) Tap edge of strip against container or clean, dry surface to remove excess urine. Compare test area to Colour Chart exactly 10 seconds after wetting. Ignore colour changes that occur after 10 seconds.